Makenzies Miracle: Look At Me! It has been a quiet weekend. The boys went to the cabin and so it was just me and Miss Kenzie! It was great! A bit too quiet but a couple of days to rest and enjoy her was a nice break! We went to church this morning in the SNOW! I thought it was never going to turn into winter! It did! I got out her toy that hangs toys down. The last time I got that out she really could have cared less. Well today she was all over it! She hit and grabbed the toys and laughed and talked(babbled). I shot a video that I posted on www.dropshots.com/makenziesmiracle. Check it out. After I shot that video I rolled up a towel and put it under her head and she really went at it. It helped her to see the toys instead of having her head flat on the floor! She is doing so well! Thank You Jesus! I am so excited that she is finding her hands! It is amazing! Not only that but she is enjoying it and even looking at what she is playing with! WOW! Baby steps! I am one proud mama! “God blesses those who realize their need for him, for the Kingdom of Heaven is given to them”. (Matthew 5:3 NLT ). God has been speaking this to me over and over in the last couple of months! It is amazing what kind of peace there is when you give it all to Him! Kids, marriage, money, health, the list goes on and on! I know that God is carrying my family through each new era in our lives. It is a great feeling! I am still human and ache for the loss in so many parts of my life but the peace the passes all understanding takes away most of the sting! Keep praying! God Bless! This site has a very simple guest book! All you need to do to sign is to enter your e-mail and create a password. We would love to hear from you! Also if you sign the guestbook or click on the box at the top of the journal you can be notified by email when there is a new post. 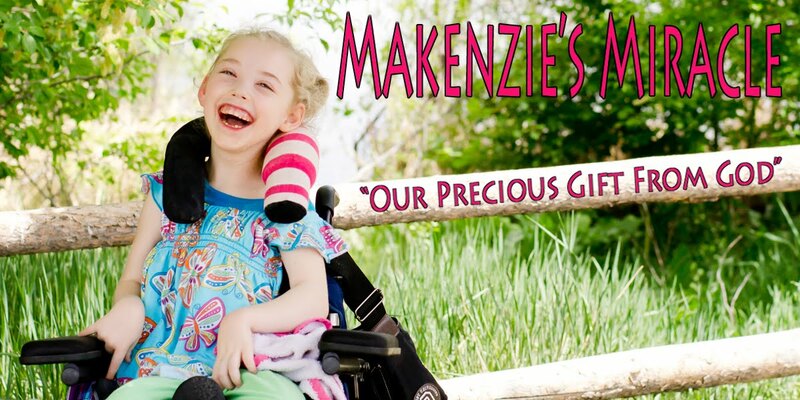 Hope to hear from Makenzie's prayer warriors! I would love that! How we acknowledge our deep dependence on you every day! We thank you that in the midst of circumstances that stretch us to the end of ourselves, you pour out greater measures of grace, peace, and mercy than we have ever known before. Thank you, Lord, that in the midst of what feels like impossible situations, you have made a way through. And even in the midst of life’s most trying times, you continue to pour out your blessings and provision to us. Lord, I ask that we would always recognize our acute need for you, and that we would always be able to see the great blessings you have showered upon us.